Updated: Civic authorities are reporting this morning that over 527 people have been injured and transported to hospitals and over 59 murdered by a gunman firing automatic weapons from the 32 floor of a hotel into a concert crowd estimated over 20,000 in Las Vegas last night. It was the final day, last performer, last song of a three day Country Music concert in the heart of the city. This massacre of innocents is the worst mass shooting in modern American history. 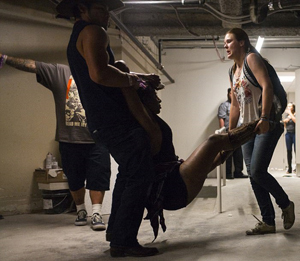 Strangers helped each other find cover and transport the injured as the horrific killing fire rained down. 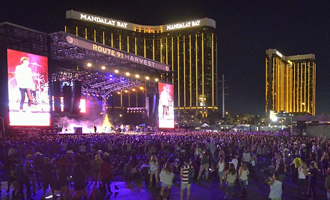 Police say the shooter was 64-year-old Stephen Craig Paddock, who opened fire on the festival taking place at Las Vegas Village from a room across the street in the Mandalay Bay Hotel at 10:08 pm. Clark County Sheriff Joseph Lombardo said that his officers breached Paddock’s room on the 32nd floor and found Paddock dead inside, among an ‘arsenal’ of 10 firearms. Lombardo said that Paddock shot himself dead. 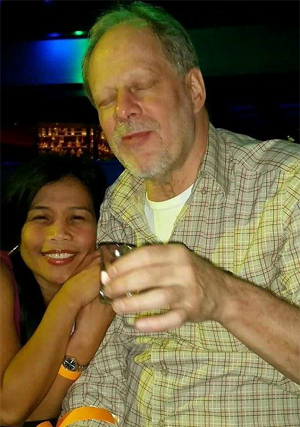 Investigators are now raiding Paddock’s home in a retirement community in Mesquite, which he shared with a woman named Marilou Danley. Danley was initially called a person of interest in the shooting, but police no longer believe she was involved after contacting her early Monday morning and finding her out of the country. Police say it appears Paddock used her ID when he checked into his hotel on September 28. At least 10 rifles were found in Paddock’s hotel room, where he had been staying for four days and had established two different shooting locations. 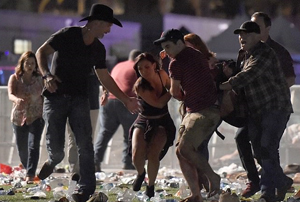 Paddock is not thought to have been part of any terror group, but Islamic extremists have claimed online in the early hours that he was a recent convert. Police in his home town of Mesquite say that they had no history with Paddock. Singer Jason Aldean who was the performer on stage as the firing began posted on Instagram: “Tonight has been beyond horrific. I still don’t know what to say, but wanted to let everyone know that Me and my Crew are safe. Click here for more from The DailyMail.com. Fox News reports, “The gunman’s brother, Eric Paddock, told reporters outside his Central Florida home early Monday “an asteroid just fell on us,” and said Stephen Paddock has no history of mental illness. This entry was posted in National on October 2, 2017 by admin. On Fox & Friends Tuesday, leading forensic psychiatrist Dr. Michael Welner offered insight into the mindset of Las Vegas gunman Stephen Paddock. To attempt to understand Paddock’s thinking, Welner suggests looking at the case of James Hodgkinson, a left-wing shooter who opened fire on multiple GOP lawmakers, including Rep. Steve Scalise, at a baseball field. “Well, if you want to understand the killer, the most important place to start is with the victims and what we can immediately see is that he had no relationship. A workplace mass shooter knows his victims. They want to destroy, annihilate the workplace. The family mass shooter, knows the family, wants to annihilate the family. “The criminal enterprise wants to kill for the gang. So, it’s a stranger mass homicide and a stranger mass homicide happens for one of two reasons. Either a person acting for a cause or a person acting because they want to transcend notoriety and kill as many people as possible — like a James Holmes. Here’s the thing — shooting for notoriety sake, and nothing more, is a young man’s crime and this is a 64-year-old with no dramatic mental illness, no major decline, someone who is intact. Shooter James T. Hodgkinson was a Bernie Supporter and Trump hater.